I ended up at Macy's One Day Sale event yesterday. Twice. I browsed the shoe section during lunch and then headed back over after work. Even Husband joined me for some shopping, which is really, actually quite rare. Hey, we love a good sale. Anyhoo, I had been eyeing these G by Guess booties since I saw some random girl in a similar pair, wearing them at H&M. I thought they looked effortlessly cool on her and hoped to pull them off just as well. They are a little more edgy for my style, but sometimes it's fun to mix it up and try something a little different than what you would normally expect from yourself. I think they are a fun addition to my ever expanding shoe collection. And besides, can a girl really have enough boots? On second thought, (especially if you are my Husband), don't answer that. I love those boots, very tough. Your hair looks great too...nice twist to ombre. I love these boots! 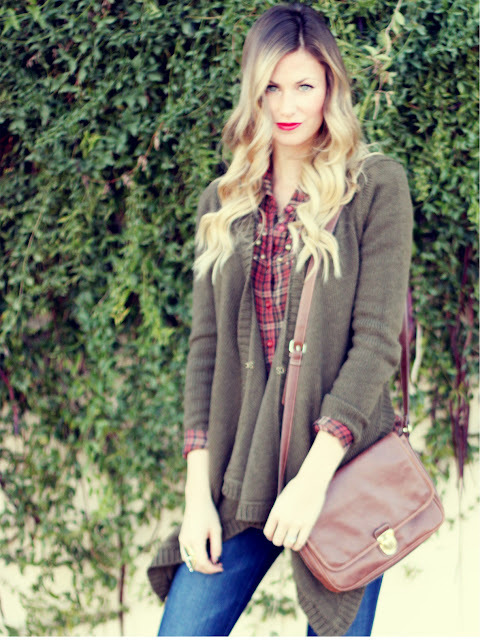 I actually love the whole look :) I'm pretty into plaid shirt right now and these worker boots make the look complete! great sale buy ;) ! You look so cute! Love your new boots!! Shopping on a lunch break...it's my weakness especially when I work downtown and there are shops galore! they're mega cute!! so i can't tell from these pics...do the boots have a heel or are they flat?? love the comfy way you styled them too!! Love the outfit! It's pretty cold here in CT, so I am always "borrowing" ideas from others' outfits. The weather is chilly for months and months so it is hard to come up with alot of cute winter outfits. way to make a girl jealous! I love them and your lips! my hubby can't grasp why I need so many shoes, but it is never ending ... I will never ever stop buying boots especially!! LOVE your outfit! And your boots are amazing! And shopping with the husband is always a lot of fun! Especially since it doesn't happen often! Haha. Love your outfit! Especially the sweater. Looks so comfy! The boots look great on you! Although they look like they might take a minute to tie! Oh those boots are to die for, they are in deed a little bit over the edgy side but you made them look so chic! They are so my taste! the edgy vibe of the boots is FANTASTIC! they make plaid look so cool! You can certainly never have too many pairs, and these are gorgeous. I tend not to buy Guess footwear, purely because they don't use real leather and my feet can't breathe in non-natural materials. That said, I love their accessories, in particular their purses. girl your ombre hair is to die for. also, now I want these boots. 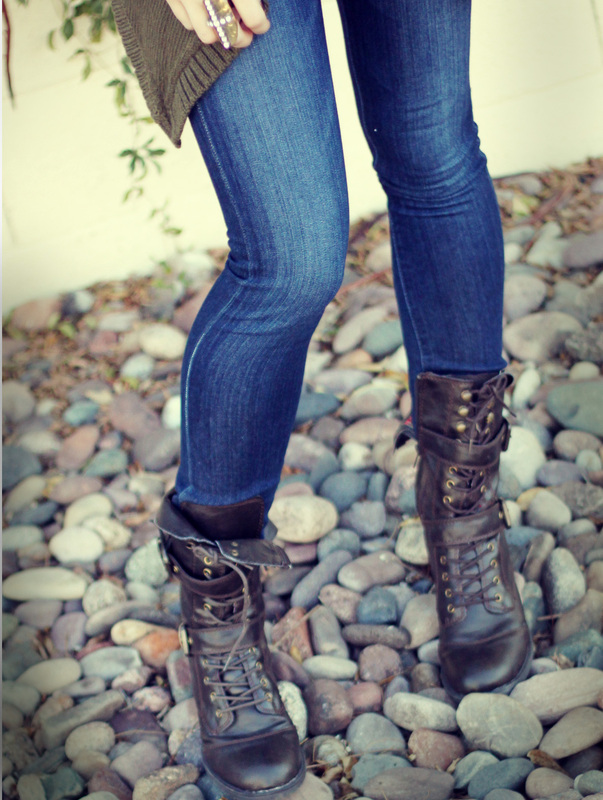 i haven't seen many people pull off the combat boots well, but your style is just beautiful! thanks for inspiring me to possibly try out some combat boots. you definitely can not have too many cool pairs of boots! i think they were a great buy! They are pretty cool! Question: Do they have a heel? Love this outfit, it looks really comfortable and cozy. They look great! I might have to get a pair of those now...I had a pair of Doc Martins in mind for the same kind of look, but I think I prefer these. I've been looking for a new pair ever since I started experimenting with wearing my hiking boots with floral and earthy dresses, but they just don't have the same look.